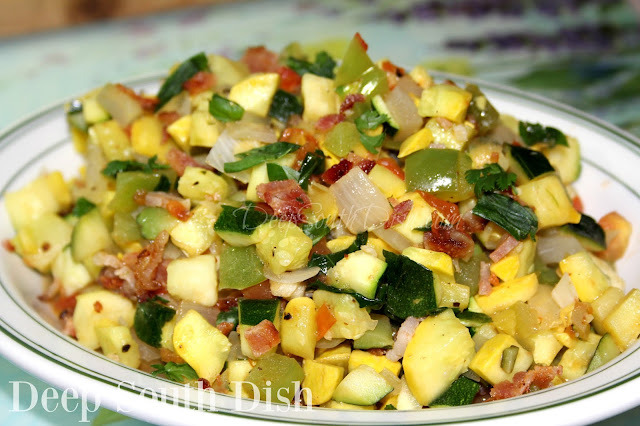 Southern Style Skillet Ratatouille - a simple stew of diced vegetables, made with bacon drippings, the Trinity of Southern Cooking, zucchini and summer squash, tomato, eggplant, okra and fresh herbs. Most folks these days seem to associate ratatouille with the Disney movie of the same name, and many may only know it from that. It actually is a real Mediterranean dish, most closely associated with France and said to have originated in Nice. The word perhaps comes from "touiller" and translates to mean something akin to "toss or stir." Traditionally ratatouille is simply zucchini and tomatoes, with peppers, garlic and onion, sometimes sliced, sometimes cut into chunks. Somewhere along the way, eggplant was included, and though it wasn't always a part of the traditional dish, it's pretty much expected these days. I decided to make it with a dice of a variety of summer vegetables that we love in the south. The difference between dicing and chopping, is that chopped veggies have very little continuity in size and cut. When sauteed, they sort of just melt into the skillet, generally as intended. Diced vegetables, on the other hand, are uniformly square, and hold their texture more once sauteed, resulting in a completely different texture and flavor from sliced or even chunks of vegetables. Although I'm a huge fan of olive oil and I do use it all the time, I've subbed in some bacon drippings and butter for it here in the spirit of the south, and used the full out Trinity of Southern Cooking - sweet onion, bell pepper and celery. Of course, summer squash is common in the south so we've used both summer squash and zucchini, along with tomato, a little eggplant and some okra, if you like, along with some fresh herbs, though dried will stand in just fine if that's what you have. Truth is, this is a very versatile dish, so use whatever your own favorite vegetables are. I love this side dish - ratatouille, with a little southern flair! Fry the bacon, saute the trinity, add in the other cubed veggies, a splash of wine, some seasonings and fresh herbs. Done and done! Here's the basics. For more of my favorite vegetable and side dish recipes, visit my page on Pinterest! Cook bacon to crisp, drain on paper towels and set aside; once cool chop. To the pan drippings add 1/2 tablespoon of butter and the onion, bell pepper and celery, cook over medium for 4 minutes. Add the garlic and cook another minute. Add the remaining butter and eggplant and cook until it begins to soften; add zucchini and squash and cook and stir 3 minutes longer. Add tomatoes, wine and okra, cover and reduce heat to medium low, cooking another 4 to 6 minutes or until squash and eggplant are fully tender. Taste and season with salt, pepper and Creole/Cajun seasoning, if using. Just before serving, toss with herbs and add bacon, reserving a pinch for garnish. Eat as is as a main dish, side dish, toss it with pasta, spoon over crusty bread, or stuff into a omelet. Cook's Notes: For a wetter consistency, add an 8-ounce can of tomato sauce with the diced tomatoes and their juices. Substitute one (14.5 ounce) can undrained, diced tomatoes. May also substitute extra virgin olive oil for the bacon drippings for a meatless meal. Hi Mary I found your site while looking for a cheaters etouffee similar to one my friend made and then I started reading all your recipes. A few weeks ago, when I was struck down with such bad morning sickness I could only manage to lie flat and read, I spent days going through the whole site! 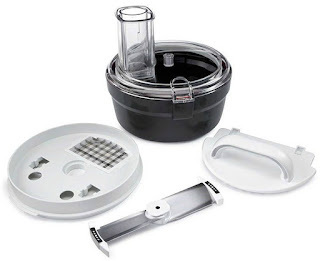 Thank you for saving my sanity and giving me so many new recipes to try. Tonight, feeling a bit better, I tried the chicken and dumpling casserole. There was supposed to be enough for leftovers but the way my husband keeps going back for one more spoonful, I doubt there will be! Oh goodness does that sound familiar! Sorry the leftovers plan got altered but I'm so happy to hear your husband enjoyed that casserole. It's a fan favorite around here for sure! Congratulations on your new arrival - I hope the morning sickness subsides. Welcome to the Deep South Dish family!! Mary, Thank you for this. As I’ve said before, even us old pros run out of ideas now and then; especially since this is the first diet that I’ve ever been on in my life. I’ve lost over 50 lbs. and Mary, over 80 lbs. This is perfect for both of us. Though I’ve only made this in the traditional French fashion, your version is epic. But as usual, I have to play with my food. I’ve actually tried this with pancetta. Don’t waste your money. I’m still a traditional bacon boy. However, what I have tried turned out to be really good. I’ve made this ‘straight-up,’ just like it is. I’ve even paired it with a good Italian sausage. It’s outstanding. And I’ve also gone the sauce route. Which my wife really seems to like. So, if mama’s happy, everyone’s happy. Hey, I’m just Irish, not stupid. Instead of using canned tomato sauce, I use crushed-up San Marzano tomatoes, well-seasoned, and with a smidge of top-end tomato paste, for my sauce. My wife’s daughter got us into this “spiralizer” thingy. With which I make spiralized zucchini. Then there’s spaghetti squash. Okay, so it’s not a steaming bowl of my homemade pasta or even De Cecco; but it’ll do. And with my seasoning and special touches, it really is quite good. Again, thank you so much. Have a great day. God bless.